Patsaouras Bus Plaza will be closed from 9 p.m. Saturday, March 7 through 6 a.m Sunday, March 8 for asphalt repairs. Vehicles and pedestrians will not have access to the plaza while work is being done. 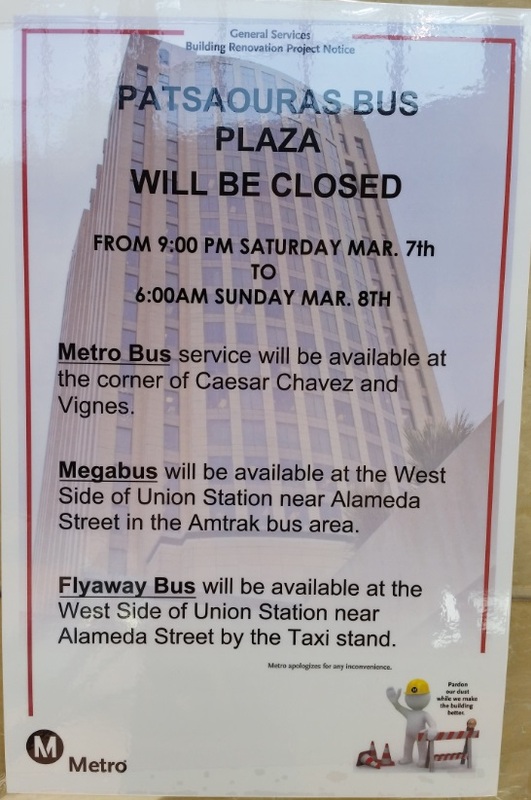 Metro buses that normally stop in the plaza will board and drop off customers at the intersection of Cesar Chavez/Vignes. Megabus.com will relocate to the west end of Union Station near Alameda Street in the Amtrak bus area. FlyAway will provide service west of Union Station near Alameda Street by the taxi stand. Additional security personnel will be on site during the closure to provide customer assistance. Visit us here at the Source or follow Metro on Twitter @metrolosangeles or @metrolaalerts to stay informed on transit news and service updates. The above closure sign can be found in the Union Station Eastern Portal and Plaza.